And then there is the coffee with the whipped almond milk-so good!! So what is next? Well, I have a few options from which I choose at the moment. I choose what I feel like having, which I think is a good way to do things for me as long as variety is a consideration. Very tasty any time of the day! I will begin by sharing with youhow this breakfast came to be. Four years ago, around this time of year, I developed a chronic, fairly severe digestive problem that would just not go away. I will spare you the details of my symptoms (LOL!! 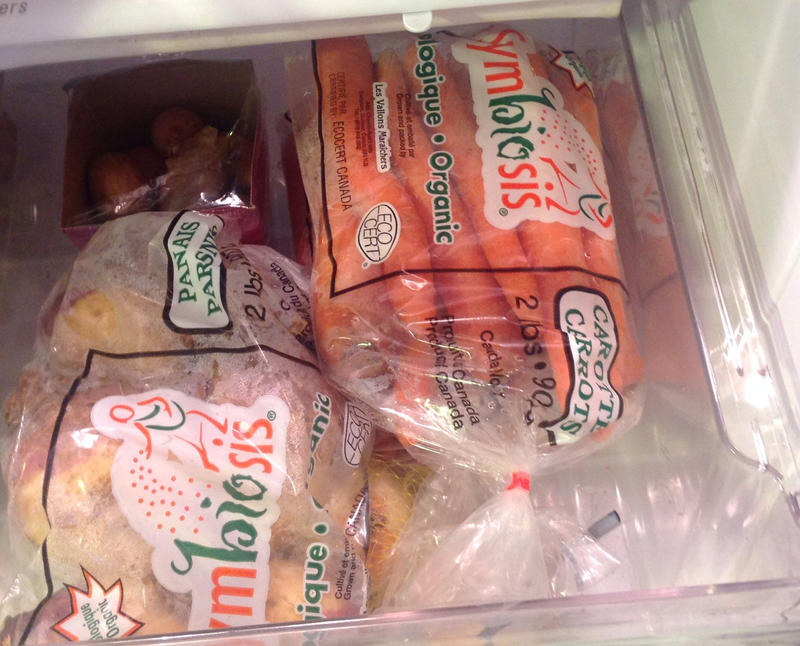 ), but I will tell you that I visited my family doctor, a naturopathic doctor and a gastroenterologist. After quite a few conversations with these esteemed professionals, as well as the dreaded colonoscopy, we settled on an acceptable diagnosis-antibiotic induced IBS. In other words, the antibiotics I had taken twice for a bronchial and lung infection had compromised my gut. Long story short, the naturopath recommended a few changes and amongst them was a new breakfast for me. 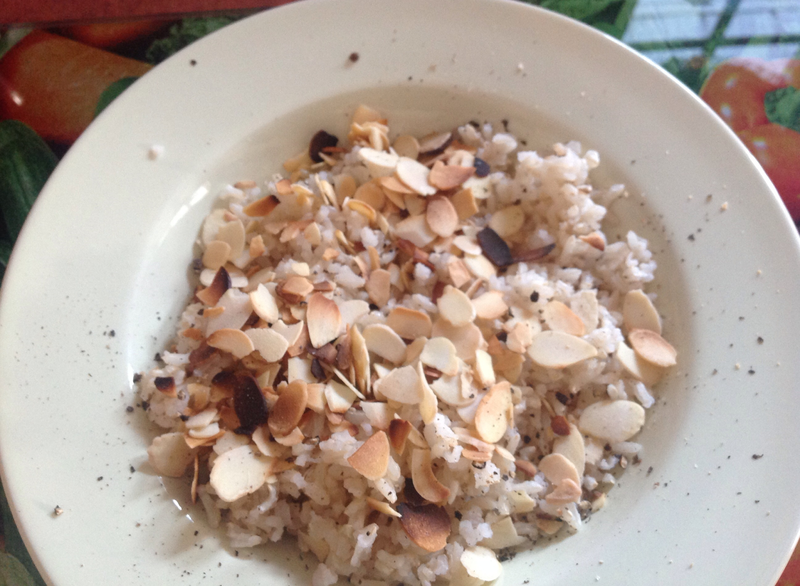 Brown Rice with Coconut Oil, topped with a few Toasted Almonds. I cannot remember why she recommended this specifically, but this, along with the other suggestions cleared up my symptoms in fairly short order. I had forgotten about this breakfast until fairly recently (not sure why), but I have put it back on the menu. I season with a little salt and pepper, heat it up in the microwave and voila, breakfast is ready. It is nutritious, filling and yummy. Bring to a boil and then turn down to a slow simmer for fifteen to twenty minutes. 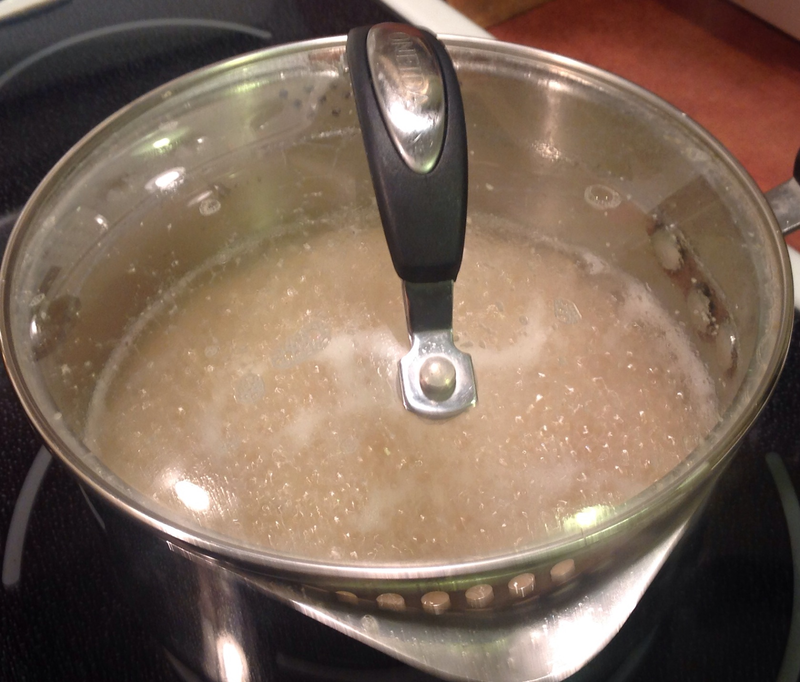 When it looks like there is no liquid left, use a fork to move a bit of the rice away from the side of the pan to check for any liquid that may be hiding near the bottom of the pan. Cook for another 5 minutes or so, if necessary and then if the rice is good to go, remove from the heat and let stand covered for ten minutes. Fluff up with a fork and season if you wish. It will keep for quite a few days in the fridge. General rule is that one part dry rice will double in size when cooked. Keep the almonds on hand too. 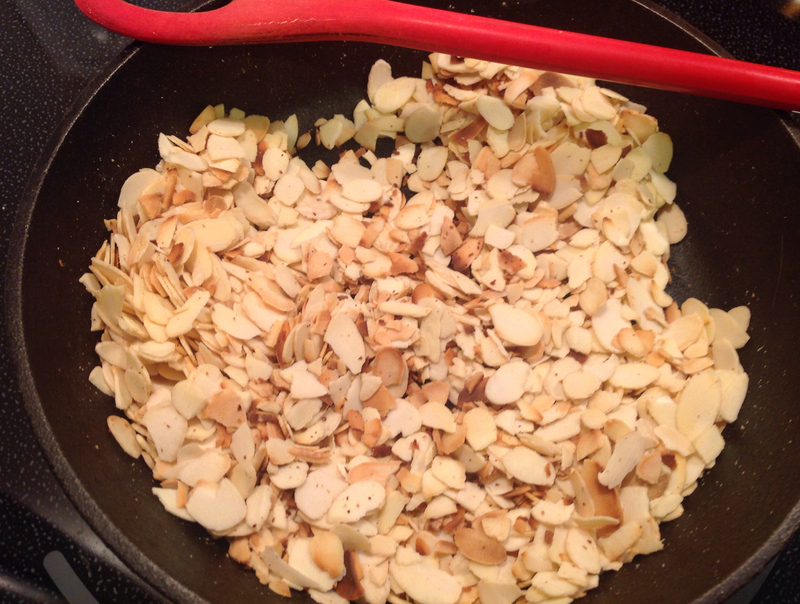 Toasted Nuts and Seeds- Place nuts in a skillet (I like to us a cast iron skillet, but this is a matter of personal choice), being careful not to overfill. You want the nuts to have enough room to toast on all sides. Start out on medium heat, but turn to low when nuts start to brown a little. Nuts and seeds tend to burn quickly, so this is a job that needs watching. You can try to eat the burned bits if you like, but I find them quite acrid. 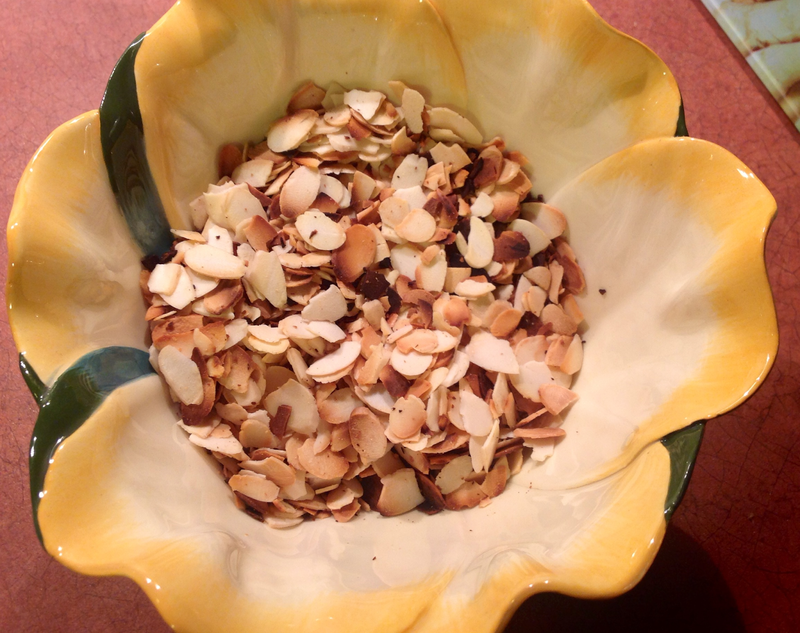 Stir gently to avoid breaking soft nuts and pour into a container to when they are ready. If you leave them in the skillet, they will continue to cook and will, most certainly, burn. Pretty huh! I like to store my toasted nuts and seeds on the counter, so I toast only the amount that I think I will need in the next few days. Also, a word to the wise, toasted nuts are very tasty and make a great snack, so if you have a nut gremlin in the house and need your toasted nuts for a specific purpose, do not hide them in plain sight…just saying!!! 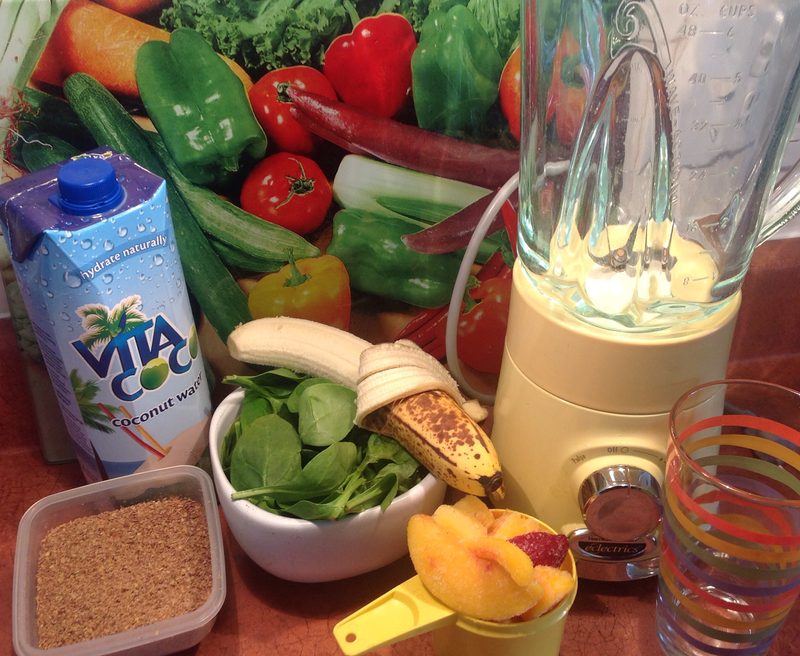 I love a Smoothie in the morning and even in the afternoon and sometimes in the evening. They are easy to make, portable, nutritious, colourful and the list goes on. 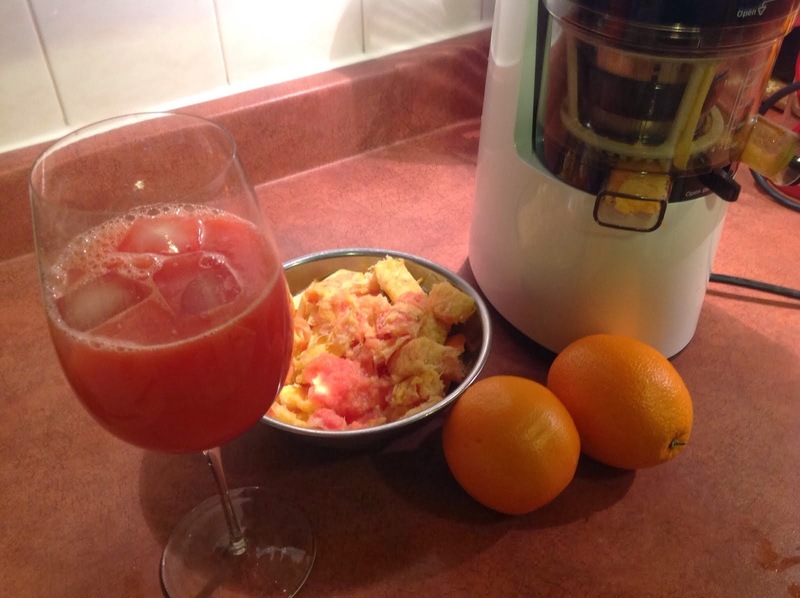 Now, over the years I have fiddled around with Smoothie recipes.-In the beginning they were made with fruit and almond or soy milk and that is about it. My daughter would sing the praises of using water instead of a nut milk and adding flax seed (for omega-3) as well as some type of greens. With some resistance, I finally tried this one day at her home and found it to be too thick, too sludgy tasting and not good at all. What I realized, after some contemplation, is that the real issue for me was the thickness of her Smoothies, not the ingredients. Quick fix for me-add more liquid. Sometimes I add 2 Tbsp raw cocoa powder, leftover silken tofu, cinnamon to taste, leftover pumpkin puree… you get the picture. 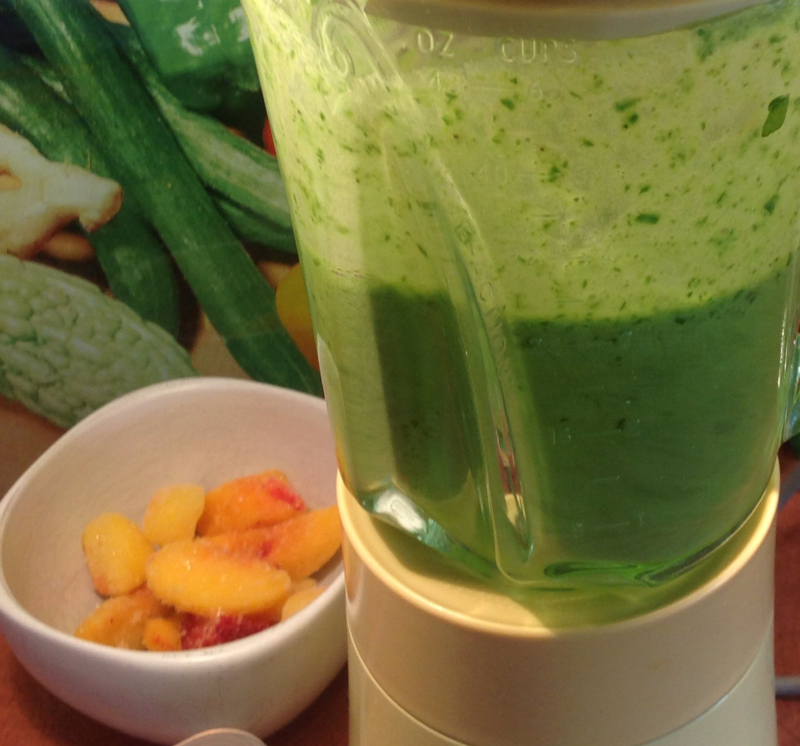 Put banana pieces and greens in blender along with liquid. Whir until blended-sometimes I need to use the pulse button to get this done. 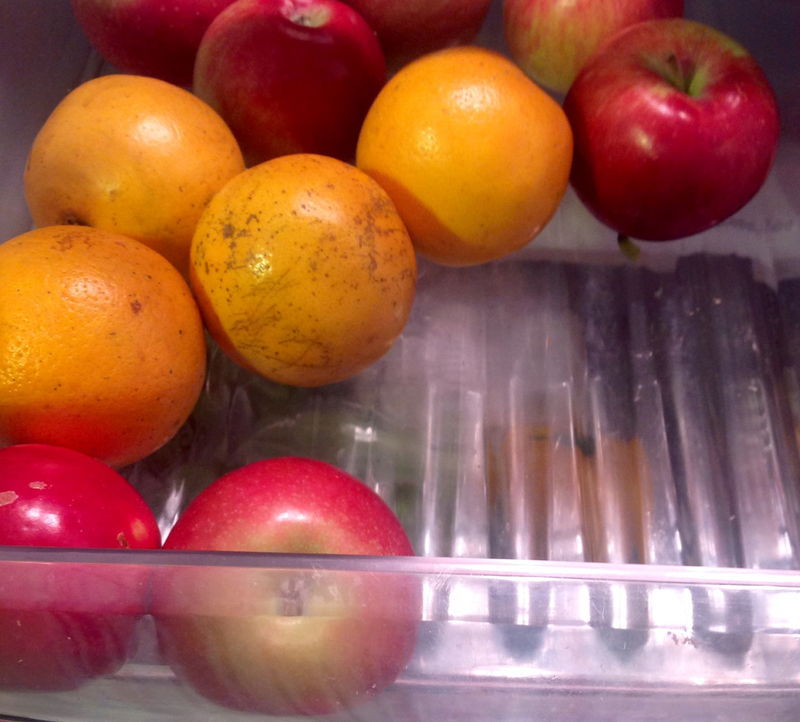 Then… add the frozen fruit and whir until smooth-you may hear a bit of clanking and clunking, but don’t be afraid, this is just the fruit resisting the pureeing process. 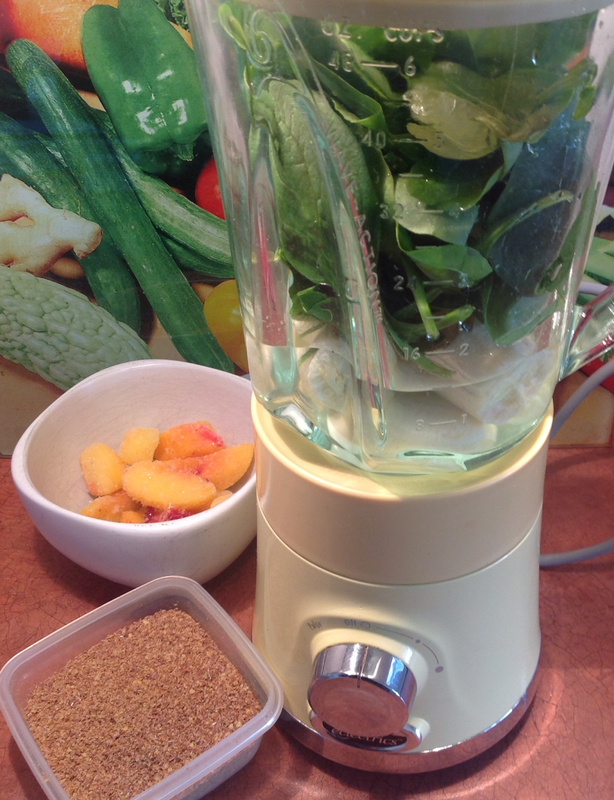 When all is quiet and the smoothie is smooth add the flax seed and whir just until combined. 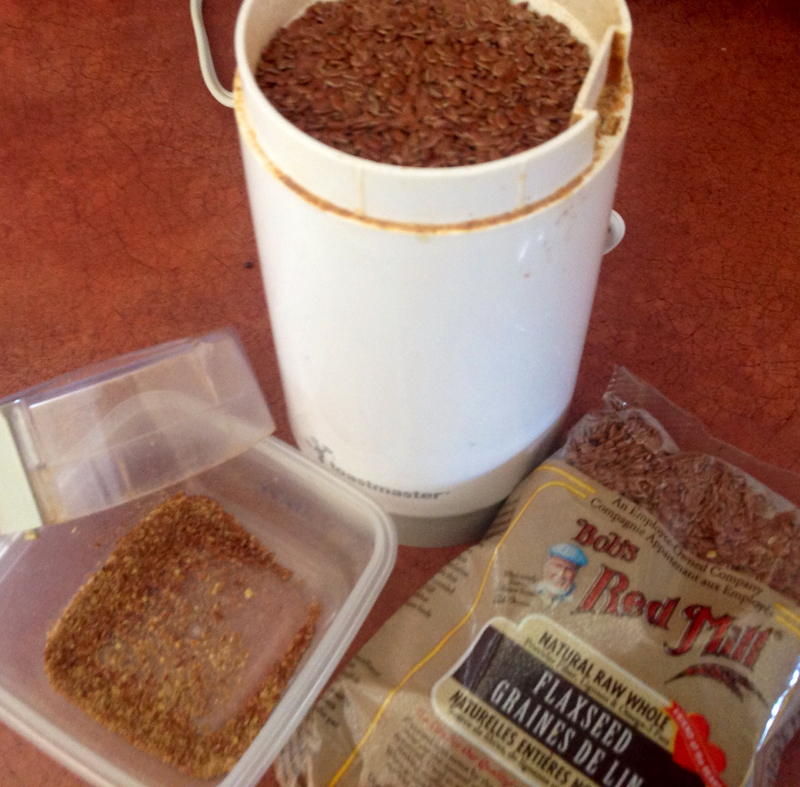 and about the flaxseed…. it looks like this. 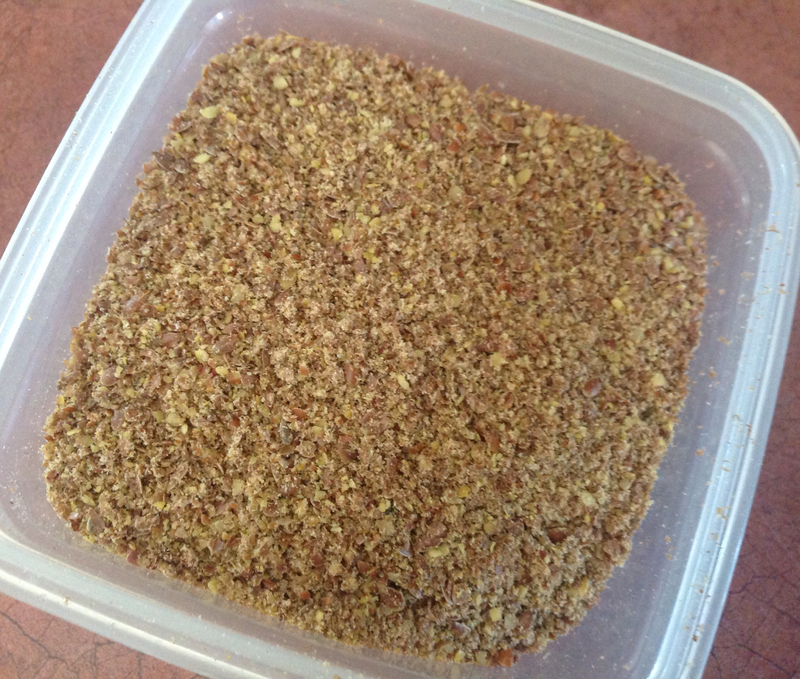 I store the ground flax seed in a small container in the fridge and use it until I need to grind some more. Sometimes I run out of ground and am in a hurry (like, I mean out the door yesterday with my smoothie in hand) so I will use flax oil. I admit, I like the taste of my smoothie better with the flax oil, but because I am adhering to a whole food, plant based diet (emphasis on whole), I use the oil only in a time crunch. When my son was living at home as a teenager and young adult, he would often have last night’s supper for breakfast. I found this so odd and unappetizing to boot. Out from the fridge would come the chili, the stew, the pasta sauce, the mashed potatoes (my son’s favourite food). But I have had the chance to think about this and although I have not done a lot of travelling in my life and have not searched this topic extensively, I do believe that we are one of the few cultures to have specific breakfast foods-usually not healthy ones at that. Many cultures eat similar foods for all of their meals. 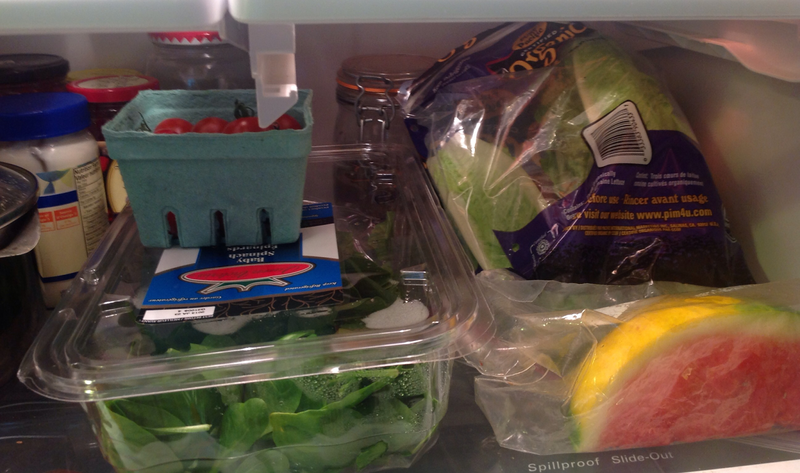 So, because I eat many more whole foods than I used to, the idea started to become much more appealing to me. So, how about last nite’s supper for breakfast? 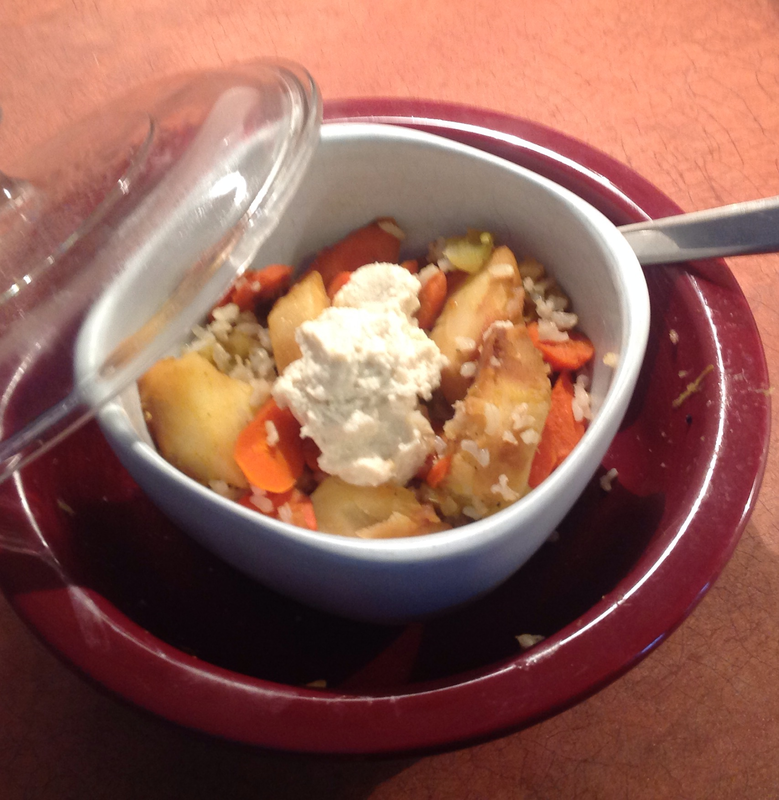 ..the remainder of the rice that was in the cute purple bowl, along with roasted parsnips and carrots, topped with cashew sour cream. And you know what?–I loved it. 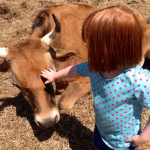 A whole food, plant based diet can open up a whole new view of what food is and can be for all of us. If you would like to try some of these foods out, or are already doing so and would like to know the easiest way to do it, follow some of my handy tips for managing in the kitchen. You will see that this way of eating does not have to include time consuming prep. Let’s break out of the limiting breakfast lunch, dinner mode. Have lunch and supper leftunders for breakfast, fruit filled oatmeal (my grand-chiblets love this) and pancakes for supper, beans and rice for breakfast. There is no wrong or right way to do it. 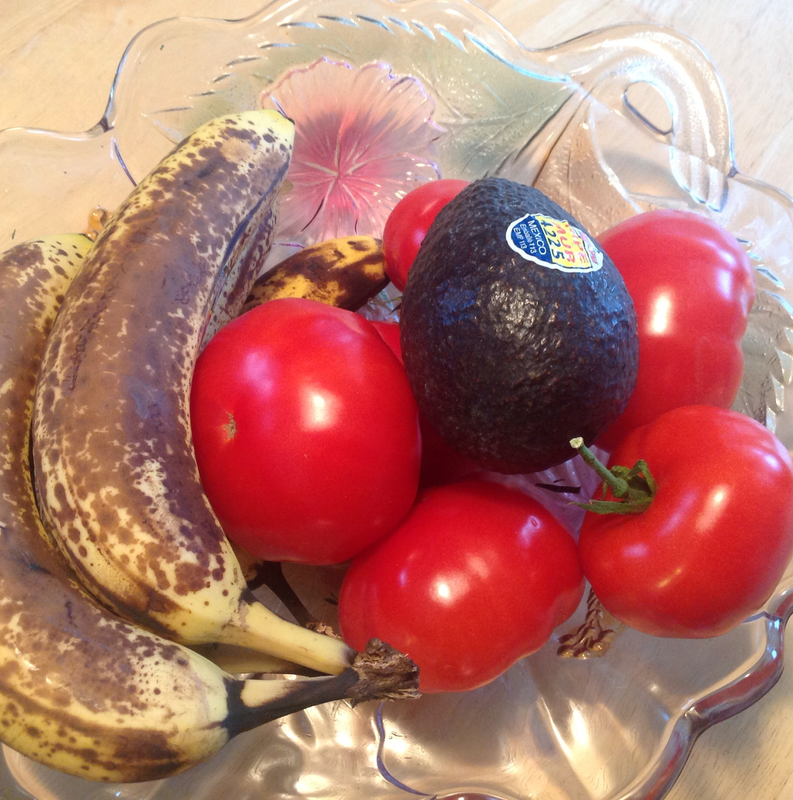 The main thing is to eat healthy food and to enjoy!!!! So much helpful information! I have been contemplating using other grains besides oatmeal in the morning – particularly maybe quinoa, or things like flax, hemp, etc. Any ideas on how to do it, or if it’s good? Glad you find the info helpful-thanks. I have seen some recipes for quinoa porridge, but have not tried them. Offhand, I am thinking that quinoa cooked in coconut milk, dates and other dried fruits, then topped with walnuts might be very tasty. 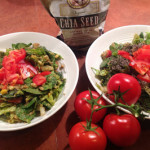 I am not that familiar with hemp and don’t know about cooked flaxseed-something to look into!